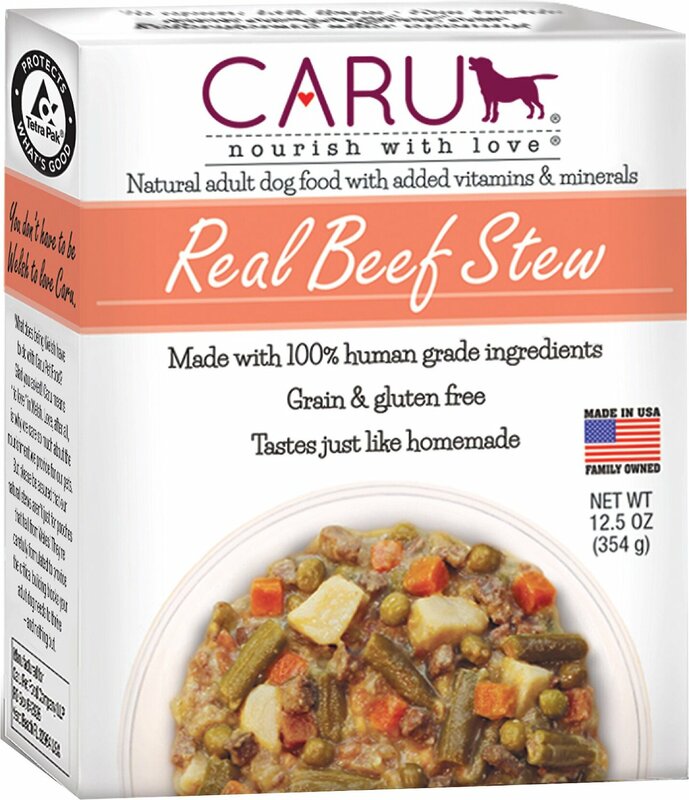 Caru is a uniquely packaged wet dog food that makes an excellent treat or topping for large dogs or a high-quality wet option for small dogs. All the ingredients in this food are 100% human grade so your dog is getting the best quality they can. Potatoes add some sweet flavor and texture. Beef and beef broth are the first ingredients. Comes in a convenient 12 pack that can be subscribed to for added convenience. Eco-friendly company goes the extra mile with environmentally friendly packaging. Easy to measure out and can be refrigerated for a few days for later use. Minimal ingredient formula is easy for dogs to digest. Suitable for dogs that have sensitivities or that are simply picky eaters! Fiber from fruits and vegetables rather than grains! Omega-3 and 6 fatty acids help keep your dog’s coat and skin in top condition. Beef, Beef Broth, Green Beans, Potatoes, Carrots, Peas, Apples, Sweet Potatoes, Tapioca Starch, Potato Starch, Tricalcium Phosphate, Sun Ower Oil, Salt, Vitamins (Choline Bitartrate, Dl-Alpha-Tocopherol Acetate, Vitamin A Palmitate, Niacin, D-Calcium Pantothenate, Thiamine Mononitrate, Ribo Avin, Pyridoxine Hydrochloride, Folic Acid, Vitamin B12 Supplement, Cholecalciferol), Minerals (Zinc Amino Acid Chelate, Iron Amino Acid Chelate, Copper Amino Acid Chelate, Manganese Amino Acid Chelate, Iodine Amino Acid Chelate, Selenium Yeast). Over 7-14 days gradually replace your dog’s food with this formula. If using as just a topping there is typically no need for a transition period. Use as a tasty topper with dry food or feed alone. When fed alone, use one pack daily for every 12 lbs body weight. If feeding with typical dry dog food reduce dry by 2/3 cup for every 1 pack of wet. Adjust the amount of food fed to meet your dog’s individual needs. Always provide access to fresh water. Adjust the amount of food fed to meet your dog’s individual needs. Always provide access to fresh water near where your dog is eating. Dogs that have high activity levels may need to have food provided in two seperate meals. While I like the Caru brand and the ingredients are top notch, this food would have to be used as just a topping at my house because I have such large dogs! I would have to feed 9 containers to one dog per day which would cost more than $20! Like so many wet foods, this is for a treat or those with small dogs. I commend Caru for creating a premium food and not adding any artificial colors, flavors, or preservatives. The packaging is also great because you don’t have to use a can opener or put a lid off and deal with sharp edges.